February 20, 2018 (Viera, FL) The World Baseball Softball Confederation has completed a visit to the United States Specialty Sports Association (USSSA) Space Coast Complex in Viera, Florida, USA, to evaluate the home of the VIII WBSC Women’s Baseball World Cup 2018 and co-sign the host contract agreement. The Women’s Baseball World Cup 2018 will be staged from 22-31 August and will be the first world championship ever to be hosted by USSSA, which became a WBSC Associate Member in 2017. The new USSSA Space Coast Complex, which includes a broadcast centre, is part of a US$ 30 million redevelopment/tourism project within Brevard County. 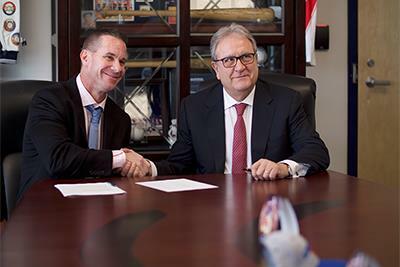 The WBSC and USSSA leaders also formally signed the hosting contract to the Women’s Baseball World Cup 2018. Ten of 12 nations have qualified for the women’s Baseball pinnacle event in Viera: Host USA, Canada Cuba and Venezuela from the Americas; Netherlands from Europe; Australia from Oceania; and Japan (five-time defending world champions), Korea, Chinese Taipei and Hong Kong from Asia. The two remaining berths will be decided at the inaugural Pan Am Women’s Baseball World Cup Qualifier, hosted by the Dominican Federation (FEDOBE) in Santo Domingo from 22-26 March. The Space Coast Stadium complex previously was the Spring Training home of 3 different Major League Baseball (MLB) teams: the Florida Marlins (1994-2002), the Montreal Expos (2003-2004) and the Washington Nationals (2005-2016). The Nationals left the complex as they moved their operations to West Palm Beach. The complex was also the home of the Class A Minor League Baseball (MiLB) Brevard County Manatees (1994-2016), which moved to Kissimmee and were renamed the Florida Fire Frogs. USSSA Space Coast Complex is located in Viera, Florida and owned by USSSA, the world’s largest multi-sport athletic organization. The complex has 15 AstroTurf fields including five NCAA Softball approved fields, five NCAA Baseball approved fields, and three fields equipped with video scoreboards. USSSA Space Coast Complex is located in Brevard County with over 72 miles of coastline and beaches and only 45 minutes from the Orlando Airport.